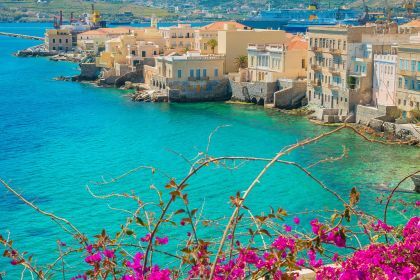 Syros offers plenty of exhilarating options for a top-notch yachting vacation, whether it’s tranquil charm you’re seeking or a bit more of a bustle of sightseeing, shopping and nightlife. 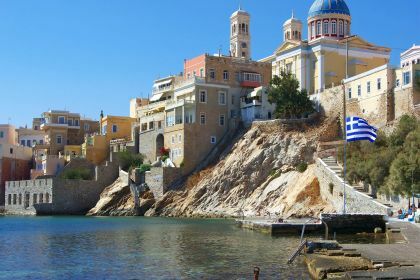 One of the smaller of the Cycladic islands, Syros’s allure lies in its seductive blend of Greek and medieval charms, the cosmopolitan bustle of its capital, Ermoupoli (also the capital of the Cyclades), and its tranquil surrounds and natural beauty. Syros is a perfectly situated starting point for an island-hopping yachting adventure. 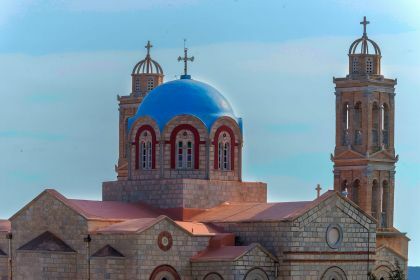 The iconic Cycladic islands of Mykonos, Paros, Ios and Naxos are all within easy reach. Step ashore to a warm welcome of stirring palm and tamarisk trees, providing welcome shade, and experience a pocket of paradise on earth. Take a seat at one of the busy tavernas with its tables and chairs spilling onto the sea sand — and sink your toes into the warm granules. Take a slow climb up the stairs to Ano Syros, the hilltop portion of the city — also known as the Catholic quarter — with its atmospheric cobbled streets, old houses and tiny churches. With its traffic-less streets and awe-inspiring views over the bay and of Ermoupolis, it’s worth the rather strenuous but short ascent up the winding sets of stairs and narrow roads. Of course there is no shortage of rich and fascinating culture on offer. 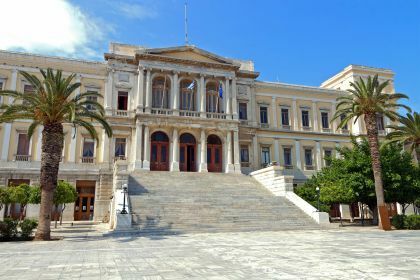 Founded at the beginning of the 19 th century and known as “the town of Hermes” (an Olympian god in Greek mythology), Ermoupoli is host to a fascinating archaeological museum. The iconic Apollon Theatre is a major architectural attraction. Constructed between 1862-1864, it remains one of the oldest indoor theatres of modern times and has been renovated for current use. Lean against its walls, breathe in the scent of history … and imagine a bygone era. For underwater lovers, there’s an impressive aquarium in Kini, a small beach village on the west side of Syros. Pop in if you fancy a peek at a variety of fish, lobsters and other sea creatures. Looking for an authentic Greek island dining experience? There’s no shortage of tantalising gourmet and rustic foodie delights in Ermoupoli. You are sure to be seduced by the variety of waterside tavernas serving mouth-wateringly fresh seafood, such as octopus carpaccio and battered cod. There are some authentic little spots in Ermoupoli for drinks and refreshment stops. Local specialities in the old town include exotic meat dishes flavoured with handpicked herbs, including rabbit with rosemary, or authentic mousaka. Get up close and personal with the rich marine life around Syros, and dive off your own yacht. There’s plenty to see, and we are talking not only of fish and crustaceans. If you’re an adventurous diver, there are fascinating caves and wrecks to explore around the island. Insider tip: For perfect sunset pictures in Syros, visit the beaches on the west of the island. Start northwest at Kini beach, move to the sheltered bay to enjoy Galissas beach, and then head southwest to Agathopes Beach, considered to be the finest in Syros. Think pristine waters and postcard-perfect surrounds.